If you’re looking for a spa day in a relaxing setting, a venue that is surrounded by endless countryside and beautiful views, then look no further than a spa day in Aberdeenshire. Not only does the area have some beautiful monuments and tourist hot spots that can be visited before or after a relaxing day in the spa being pampered, but it also offers a range of natural wildlife that can be seen in all parts of the county. 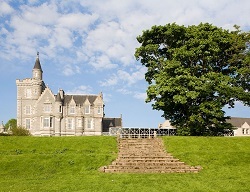 Enjoy your spa day in this tranquil area of Scotland and take in the scenery whilst appreciating a wonderful healthy lunch in the hotels gardens. The Mercure Ardoe House is located within this beautiful county and offers a wide range of options when it comes to spa days. From great value packages offering a 25 minute treatment for each guest, to top of the range spa days offering over 3 hours of relaxing and rejuvenating spa treatments. Many extras can be added to your chosen package, so if you fancy an extra treatment or even lunch or dinner at the hotel then let us know and we will be more than happy to enquire about this on your behalf.